This can be used for many things. It can be used for flensing fat off seals. It can be used for skinning a variety of animals. It can be used for cutting a whale. It’s a multipurpose heavy tool with all-around practical uses. The ulu or uluuraq (woman’s knife) is nearly universal among Arctic peoples. The addition of -pak to the name for this knife signifies its large size. Uluuraq blades are often semicircular but can be other shapes as well. They were originally made of ground slate or chipped stone, later replaced with steel. This knife has a steel blade, wooden handle, and ivory retainers. This knife would be used for flensing whale blubber or cutting up large mammals. The maker would have soaked the handle in water, inserted the blade, and then let the wood dry around it for a shrink-tight fit. Bernadette Alvanna-Stimpfle: Qaniqugaagasiguuq una ulu. Alvira Downey: Sumik atiqaġmagaan ulu, sumik suli? Sylvester Ayek: Sumun una uluuva? Maybe whale and ugruk [bearded seal], maybe used for bigger game. Willie Goodwin, Jr.: Yes, whale. Jana Harcharek: Where did it come from? Sylvester Ayek: Maybe used for bigger game? Alvira Downey: Immakii uluiñŋaġmiŋ, satkuiñŋaġmiŋ, tamarra uluŋi. Them people long ago, they don’t have ulu like our ulus. And they have this kind. My husband found one too one time, from under the ground. Jade with ivory ipu [handle]. Sylvester Ayek: And the ladies had sewing ulus called kimalit [small ulu]. Would you call that? Faye Ongtowasruk: We call that uluqitaq [small ulu]. Sylvester Ayek: Kimalit. King Island, kimalit. Faye Ongtowasruk: The small ones what we use for sewing, we use the uluqitaq [small ulu]. And some of them they use them for puuksriuqamiŋ [when they make a seal poke], kikiaqmaruŋ qamna [when they remove the skin from the carcass]. Faye Ongtowasruk: Because it’s small, this one. Una ulu aktuuruq [this ulu is big]. That might be good for amiksraq [skin], you know. Amiksriuqtuat [when they make skins (for skin boats)]. I was trained for splitting the skin too, when I was young. Walrus skin, they use big ulus. Alvira Downey: It’s made of rock? Willie Goodwin, Jr.: It’s metal. Sylvester Ayek: Yes, metal. […] Sawiviniq qaitinagu uaptiŋnun, sillimik unniin, uyaġaŋmik uluit siguqaaqtut. Willie Goodwin, jr.: Aippaani ulut taapkua sikuqaġuurut aŋmaamiglu suli isiŋnamik. Rachel Riley: The handles are all different, sheep horns, caribou horns. Sylvester Ayek: They usually make this out of trunk, or spruce trunk. Faye Ongtowasruk: And they got special materials, what they select before. I never pay attention too much when I was young. Until I get later, when I get older, when I start to do thing; sewing and skinning, those things. Sylvester Ayek: And they use ivory handles, like you said, and bone handles. Jana Harcharek: Ivory and what, bone? Sylvester Ayek: Bone, yes; and antler, ribs, and walrus jaw bone. Herbert Foster, Sr.: Qanuq aasiiñ split-aqługu? Herbert Foster, Sr.: That amiq [hide], that walrus. Faye Ongtowasruk: That walrus, yeah. Faye Ongtowasruk: Taamna uqsrum tuŋaani ittuaq amiksraq, camp-aġapta natiġiksraġiikkut. We use it for flooring. See, see the difference? Herbert Foster, Sr.: Iglua taamna atulaitpisiuŋ? Faye Ongtowasruk: So the skin becomes two skins. They split the skin in two, on the middle there is a line. And the first side, they use it for skin boat, and my parents use the other side, close to the fat part for qapsrak [flense], we use that for camping floor. Because that time, we mostly live in Inupiaq way. Ugua piilat canvas-it, kisian married-taġama, tamatkunuŋa iliqtut. (These canvas types only came out by the time I was married). Ron Brower, Sr.: Wood handle with a blade pegged down with ivory. Using wood pegs, steel too. Qavraunnaq [seal fat flenser]. Ron Brower, Sr.: This can be used for many things. It can be used for flensing fat off of seals. It can be used for skinning a variety of animals. It can be used for cutting whale. It’s a multipurpose heavy tool with all-around practical uses. 1. 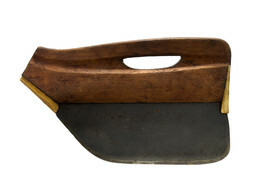 An ulu is a term used in English that is the Iñupiaq word for “woman’s knife,” which is a knife with a semi-lunar blade. It is also called an uluuraq in Iñupiaq, and has somewhat different names in the other Eskimo-Aleut languages of Alaska—ulaaq in St. Lawrence Island Yupik, uluaq in Yup’ik, and ulukaq in Sugpiaq (Alutiiq).